Good lord... Martyrs makes Hostel look like Toy Story. This was one of the most brutal movies I have ever watched. It was also one of the most transcendent and powerful. This is a hard movie to summarize, because each of its two halves is almost an entirely separate movie from the other, although it's all part of one story. The movie opens with a young girl named Lucie escaping from the building where she has been held prisoner and subjected to extreme abuses for a long time. As she escapes, she tries to free another girl, but is unable to, and leaves her behind. The police are unable to locate her captors, and she is placed into an orphanage, where she and a girl named Anna form a very close friendship. Lucie is continually tormented by a horribly disfigured woman, who she feels safe from when she is with Anna. An abrupt cut to fifteen years later, and Lucie bursts into a family's home, killing them all with a shotgun. She calls Anna to tell her that she has killed her torturers, and asks for help burying the bodies. Although Anna worries that Lucie has killed the wrong people, she goes to help her friend. Lucie is attacked again by the creature, but we see from Anna's point of view that Lucie is actually harming herself. The creature is in her mind, a manifestation of the guilt that she felt for leaving her fellow prisoner behind years earlier. At this point, I was a little disappointed, thinking that I was going to get a replay of High Tension. Lucie tells the creature that she has killed their torturers, and that it can rest, but it continues to punish her. She realizes that she will never be free of the damage that was inflicted on her, and slits her throat, dying in Anna's arms. You should probably duck out now if you don't want major spoilers. I'm not going to reveal the ending few twists, but there's a big plot point that I'm about to reveal. See, Lucie did kill the right people, but those people were only part of a much larger organization with very, very sinister goals. An organization which captures Anna and begins to carry out their plans on her. 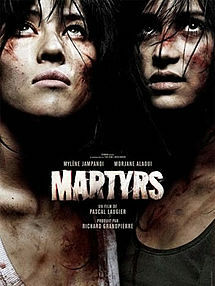 The organization, headed by a woman simply called Mademoiselle, wishes to create a martyr. Not a martyr in the sense that we usually think of, where somebody dies for a cause, but a martyr in the original Greek meaning of the word, a witness. In this case, a witness to things that are unknown to the rest of us, and which can only be revealed through suffering. Suffering which Anna spends the rest of the movie bearing. I don't actually even want to tell you exactly what's done to her, for a couple of reasons. One, if you do see this movie, I want it to gut punch you in the same way it did me. Two, if I just describe it, everything will end up sounding tawdry and mundane, like a play-by-play of torture. It would be soooo easy for this film to have teetered over the edge into exploitation, but the very extreme violence, as scarring as it was to watch, actually ends up leading into a really unforgettable ending. I can't say it's beautiful, because I just can't put that word on the experience, but I can tell you that in the final scene between Anna and Mademoiselle, I actually gasped out loud in amazement. I DO NOT recommend this movie to just anybody. Seriously, it is not a sprint, it is a marathon. Watching this movie will exact a toll from you. But if you are prepared to go where it takes you, I think you will end up agreeing that this is one of the most unique horror movies you've seen. I give it five lights-from-the-other-side out of five. Almost dost thou persuadest me.... to break my vow not to watch scary movies any more!